It will be a champagne year for Paul Taylor, who turns 70 years old on July 29, and the Paul Taylor Dance Company, which promises to have one of the most active 12 months in its 46-year history. A 32-city national and world tour are in the offing, as well as three world premieres by the master and a series of on-and-off-stage birthday bashes. In the meantime, Taylor 2 will be seen in 44 American cities, where it will perform and offer workshops, master classes and lecture demonstrations. Brimming with activities, the yearlong birthday celebration officially begins at Jacob’s Pillow on July 25, where the company will present the world premiere of Fiends Angelical, set to George Crumb’s string quartet Black Angels. Performed on a mirror-like floor with the dancers occasionally bathed in harsh light, the darkly mysterious dance poetically suggests a primal ritual of transformation. Santo Loquasto is the set and costume designer and Jennifer Tipton designed the lighting. The dance was commissioned by Irene M. Hunter. In addition to performances by the Paul Taylor Dance Company at The Ted Shawn Theatre, Taylor 2 at the Doris Duke Studio Theater, and a birthday celebration following the opening night performance, a lesser-known side of the choreographer will be revealed: Taylor the visual artist. A major exhibition of Taylor’s beautiful, wry, poetic and witty assemblages created from found objects including shells, driftwood, rocks, bugs, a pair of children’s shoes, will take place throughout the summer in the lobby of the Ted Shawn Theatre and in Blake’s Barn. The Company’s week at the Pillow will also feature an interview with Paul Taylor by Village Voice critic Deborah Jowitt, discussions with Taylor dancers, and a series of outdoor performances of works by Taylor alumni Rachel Berman, Caryn Heilman, Cathy McCann, Karla Wolfangle, and David Grenke. OTHER (NEW) DANCES: In addition to Fiends Angelical, Taylor will create two new dances over the next ten months. Although information on the new works is presently embargoed, what can be revealed is that the first will receive its world premiere at the Annenberg Center in Philadelphia, November 16-18, and will be seen in New York for the first time in March 2001 during the Company’s annual City Center season. 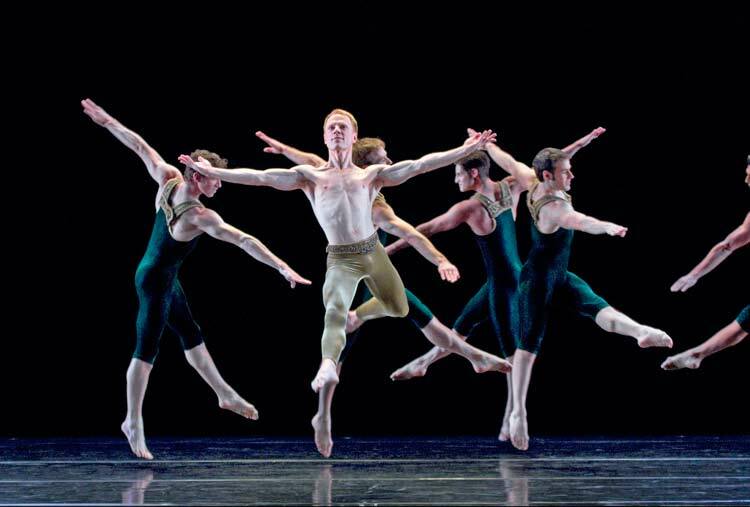 The second new dance, a Kennedy Center Commission for American Ballet Theatre, will have its world premiere by ABT at the Kennedy Center Opera House on April 10. The dance will then be premiered by the Taylor Company at The Fox Theater in St. Louis, MO, May 11 & 12, 2001. CAPITAL STEPS: The Taylor Company will continue on the second leg of its Cultural Capitals of the World Tour 2000/2001 with performances in four cities in France: Tarbes (October 19); Narbonne (October 21), Lyon (October 24) and Martigues (October 31). The company will then travel to Rome, where it will perform at the Teatro Olympico, November 2 & 3, before going on to the Sadler’s Wells in London, November 7-11. STATES OF DANCE: Domestically, the troupe will be seen in major theaters throughout the United States in the next ten months. Venues include the Kennedy Center in Washington, DC (October 6-8); the Yerba Buena Center for the Performing Arts in San Francisco, CA (March 21-April 1); the Alex Theatre in Glendale, CA (April 6 & 7); the California Center for the Arts in Escondido, CA (April 10); the Eccles Center for the Performing Arts in Park City, UT (April 20). HOME RUNS: New Yorkers will have a chance to see the Taylor dancers close-up in two different settings in the upcoming months: first outdoors when the Company performs as part of Lincoln Center Out-of-Doors, August 11 and 12, and then during its home season at City Center, February 27- March 11. At Lincoln Center’s Damrosch Park, the program will feature a triple-bill of Taylor ‘s recent hits and classic dances: Cascade, Lost, Found, and Lost and Piazzolla Caldera. At City Center, there will be two New York premieres including Fiends Angelical. For more information on City Center, stay tuned. Metropolitan Life Foundation is the proud sponsor of the Taylor Company’s 2000-2001 National Tour. Time Warner Inc. is the 2001 sponsor for the Taylor Company’s City Center season. Additional support for the City Center season is provided by the Fan Fox and Leslie R. Samuels Foundation and the New York State Council on the Arts, a State Agency. The Cultural Capitals of the World Tour has been endorsed by the White House as an official project of the White House Millennium Council. The work scheduled to be given its world premiere in Philadelphia has been commissioned through the Paul Taylor New Works Fund, with major support from the John S. and James L. Knight Foundation and the National Endowment for the Arts. It will be presented in Philadelphia at the Annenberg Center by Dance Affiliates and Penn Presents, followed by performances in Columbia, SC, at the Koger Center for the Arts.